Analyzing such a parallel RL circuit, like the one shown here, follows the same process as analyzing an RC series circuit. So if you are familiar with that procedure, this should be a breeze. If your RL parallel circuit has an inductor connected with a network of resistors rather than a single resistor, you can use the same approach to analyze the circuit. But you have to find the Norton equivalent first, reducing the resistor network to a single resistor in parallel with a single current source. where i(t) is the inductor current and L is the inductance. You need a changing current to generate voltage across an inductor. If the inductor current doesn’t change, there’s no inductor voltage, which implies a short circuit. Kirchhoff’s current law (KCL) says the incoming currents are equal to the outgoing currents at a node. Use KCL at Node A of the sample circuit to get iN(t) = iR(t) =i(t). The RL parallel circuit is a first-order circuit because it’s described by a first-order differential equation, where the unknown variable is the inductor current i(t). A circuit containing a single equivalent inductor and an equivalent resistor is a first-order circuit. Knowing the inductor current gives you the magnetic energy stored in an inductor. In general, the inductor current is referred to as a state variable because the inductor current describes the behavior of the circuit. 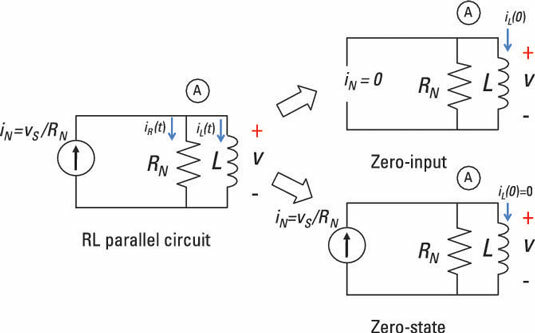 Here is how the RL parallel circuit is split up into two problems: the zero-input response and the zero-state response. Here, you’ll start by analyzing the zero-input response. For an input source of no current, the inductor current iZI is called a zero-input response. No external forces are acting on the circuit except for its initial state (or inductor current, in this case). The output is due to some initial inductor current I0 at time t = 0. This is a reasonable guess because the time derivative of an exponential is also an exponential. Like a good friend, the exponential function won’t let you down when solving these differential equations. The constant L/R is called the time constant. The time constant provides a measure of how long an inductor current takes to go to 0 or change from one state to another. To analyze the RL parallel circuit further, you must calculate the circuit’s zero-state response, and then add that result to the zero-input response to find the total response for the circuit.